Cheering for any professional sports team is an odd phenomenon. The appreciation for the sport isn't weird, but loyalty for one team is a bit weird. It becomes difficult to pin down what it is specifically you are cheering for. Socrates: So you mentioned that you like the Cubs players. Socrates: And you profess to hate the Cardinals of St. Louis, I hear. T.R. : Yes, very much so, Socrates. Socrates: What if the Cubs and Cardinals enacted a trade where the Cubs sent every single one of their players to the Cardinals in exchange for every single one of the Cardinals players. A team-for-team trade as it were, mangers and coaches as well. Surely your allegiance would shift and you would be a Cardinals fan then, right? T.R. : No way. I would still be a Cubs fan, and all the guys that used to be Cardinals are now Cubs. So I would cheer for them, as difficult as that may be at first. Plus as I ment ioned, I like more about the Cubs than just the players. Some people refer to this concept as "cheering for laundry", since I'm basically going to support anyone that wears the Cub uniform. Socrates. : I see. Yes, you also mentioned your love of their venue and neighborhood. Imagine then, if shortly after the Cubs and Cardinals team-for-team trade commenced the Cubs owner announced some more news. Suppose they were to say that the Cubs are closing Wrigley Field because it was found to be in violation of a public safety code, due to its engineering unsoundness. The governmental powers-that-be were forced to close Wrigley Field and the team announced that as a result of Wrigley's irreparable unsoundness it would be moving to the suburb of Schaumburg . They would still be the Chicago Cubs, but would no longer play their home games in Wrigley Field, or in the area known as Wrigleyville. Would they cease to be your favorite team then? T.R. : Wow, I don't even want to think about that. But yes they would still be my favorite team. Socrates: Oh wow, I thought that might make you abandon them. Suppose then that the Cubs owner then said, "To celebrate our new beginning in Schaumburg we are going to change our home uniforms to hot pink, and our road uniforms will be plaid". Surely, this departure would be too much for you and you'd find a new favorite team. T.R. : You are a sick man, Socrates. A sick, SICK, man. You are wrong on many levels- and one of things you're wrong about is me abandoning them. I'd root for pink or plaid Chicago Cubs. I really can't fathom them changing uniforms like that, but for the sake of the argument, I will concede that I would still support them. Socrates: I will concede in kind that it is unlikely. But maybe Macy's will buy the Cubs. After taking over Marhsall Field's, they set their sites on an even larger Chicago jewel- the Cubs. In the effort of promoting their wares, they instituted the plaid to focus on the team's fashionable ownership. 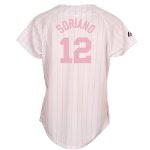 When this decision generated so much poor publicity, they announced the pink uniforms in an effort to heighten awareness for breast cancer and 15% of the sales from replica pink jerseys would be going to Breast Cancer research. 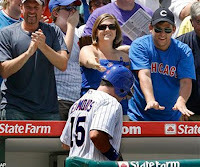 Would you publicly object to the Cubs being the most visible opponent of Breast Cancer? The Chicago Cubs could go down in history as the team that defeated Breast Cancer. T.R. : Wow, that's some moral hardball you're playing. T.R. : It's a baseball analogy. Anyway, if all of that happened I would still favor the Cubs, and be proud of them being at the vanguard of cancer research. 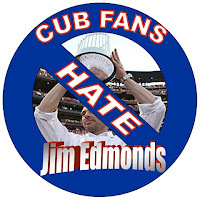 Heck, I might even accuse my friend's favorite teams of being less moral than the Cubbies or even pro-cancer! Socrates: Interesting indeed. So let's recap here- we know that you love the Cubs. There is no doubt about that. But what you do love about them isn't their players, manager, venue, or uniforms. T.R. : Yeah, I guess I did say all of that. Socrates: And you like the name- the Cubs? T.R. : Yeah, it's unique. They're the only team I know of that's nickname is a dimunitive. They aren't The Bears, they're the baby bears, the Cubs. You don't see teams nicknamed puppies or kittens, or tadpoles, or ducklings. Plus a cub is tangible, it's a literal thing, unlike the Red Sox- "sox" isn't even a word. Or the Padres or Yankees, or the Miami Heat. A nickname ought to have a tangible instantiation. Socrates: Glad to see such a young, handsome man like yourself has given it some thought. Now indulge me this silly idea. Suppose a small business owner came forward with his powerful attorney and said that his great-great grandfather was a candy maker. Socrates: His grandfater made several very popular varieties of candy in the late 1890's, his best selling candy was the predecesser to what we now call Gummi Bears. He called them "Chicago Cubs", but more importantly- he had the legal naming rights to that name. This man's great-great Grandson and his attorney are now demanding that the Chicago Cubs baseball team change their name, as they are planning to reintroduce their line of candy in 2009. Socrates: Easy now, my strapping young lad... Did this not happen to the WWE? You recall it was once the WWF- World Wrestling Federation, until it was sued by the Word Wildlife Fund. Even though it was a billion-dollar titan of the entertainment industry, the (now) WWE had to change. Surely you must concede it is at least possible that this could happen to the Cubs. T.R. : I guess it is possible, yes. Socrates: So if they changed their names to the Chicago Women, wore pink uniforms, played in Schaumburg, and fielded a team full of men that just yesterday played for the St. Louis Cardinals, they would still be your favorite team? T.R. : Are you trying to make me vomit?? *Sigh* Yeah, I guess so. Socrates: I see. This is truly a bizarre loyalty you posses, Mr. Slyder. 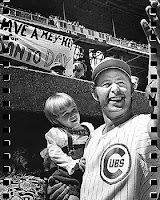 Now you also expressed a fondness for their history- citing Ron Santo. 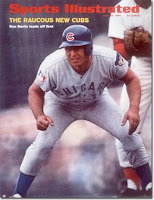 Socrates: And you feel that Ron Santo embodies "Cubness", whatever that is? T.R. : Absolutely. Unquestionably. He's the Alpha Cub. Socrates: And Ron Santo, at least on occasion, is willing to drink alcoholic beverages- is he not? T.R. : Not to a problematic extent or anything, but I have heard that he does drink, yes. Socrates: Very well. Suppose then, my ruggedly handsome young friend, that you and Mr. Santo were drinking together in Wrigleyville during the offseason. Being a beloved Cub great, people kept sending drinks over to your table. You and Ron were having a great time, and gladly accepted all these drinks and graciously drank them down as to not offend Ron's admirers. The two of you are telling funny stories about yourselves and even admitting a few things you probably never would have if you were not drinking. After a few hours of this you found yourselves to be very drunk. Like bleary eyed, stammering, bad breath, closing-one-eye-to focus-drunk, what's the word for it when you're that drunk? Socrates: Yes! Thank you. You and Ron were stinko. Then, for the sake of our story, Ron announces that he needs to make a visit to the restroom. After he excuses himself, you realize that you need to make a stop as well. When you walk in, about 20 seconds after Ron, you see he is the only one using the restroom and he's standing in front of a urinal. He's so drunk that as he is using the urinal has his pants around his ankles, but still wearing his underwear. But these aren't just whitey tighties. They are St. Louis Cardinals underwear. And appear to be a large size version of women's underwear. Your Cub hero is wearing St. Louis Cardinals women's underwear. (NOTE TO READER: I was going to use my Cub hero's name in that sentence. But I didn't want a Google search of his name + "wearing St. Louis Cardinals Women's Underwear" to produce any hits). You express your shock, horror and disdain for his choice of attire, and he turns his head and casually says "Oh, these? Yeah. I wear them all the time. The pink one is in the wash. I have actually loved the Cardinals all these years and sercretly hate the Cubs with a passion so intense...."
T.R. : EW! NO. No. No. No. That's the dumbest crap I have EVER heard. I've never even accidentally THOUGHT anything so stupid, much less heard anything so stupid. That is not possible and you know that. Socrates: Ha ha, yeah I know. I'm surprised you let me get that far. I kept waiting for you to cut me off, I actually didn't know what I was going to say next if you hadn't cut me off just then. Man, you should have see your young handsome face when I said "women's underwear". T.R. : No. Moving out of the city would be too much. They wouldn't be the same team then. Socrates: So that is the rub then. You like them because they are Chicago's team. T.R. : I guess so. But we also have the White Sox. I'm not sure if the White Sox would be my team if the Cubs left town. Socrates: What if the White Sox decided to legally become the Chicago Cubs, and completely did away with themselves as the White Sox? T.R. : Would they play in Wrigley? Socrates: Nope, it's still shut down due to health codes. They're still at US Cellular Field. They would just be the Cubs now, and even have their back-to-back championship trophies from 1907 and 1908. Oh, and they would be in the American League Central. But, they would be the Chicago Cubs. T.R. : *sigh* You drive a hard bargain, but yes. Socrates: Ah. So it seems that you have told me that the players do not affect your team loyalty, nor does the coach. The venue, uniforms and team name are also immaterial. T.R. : Yeah, I guess I did say all of those things. Socrates: So we now know what is not essential to a fan's loyalty. And what is completely vital appears to be only that they are the team that is the current representative for the team that used to be the Chicago Cubs and they must still play in Chicago (or a suburb), regardless of- their name, their colors, their members, or where their stadium is, but if they have the legal rights to Cubs history, you're ok with them. T.R. : Odd, but yeah. I guess I don't disagree with that. 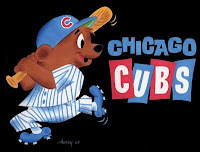 Socrates: In other words, all that matters is, 1) They represent the Cubs in some fashion which represents the original Chicago Cubs, and 2) They are in Chicago, and 2B) aren't the Chicago White Sox. T.R. : Again...yeah, I mean...I never would have thought about things this in-depth, but you are correct again. Socrates: Ok. So we agree what is important to you is that the Cubs history is somehow maintained, and that the team that maintains their history plays in Chicago? T.R. : Well, yeah, I guess that's all I really need. Socrates: So history and Chicago-ness comprise "Cubness" then? T.R. : I'd agree with that. Socrates: I never understood sports at all, much less fan loyalty. It is a truly irrational passion you have, my boy, but I am glad we have settled this today.